Masala Omelette is one of the quickest and tastiest recipe for breakfast with toasted bread slices. It also makes an easy brunch, light lunch or dinner. 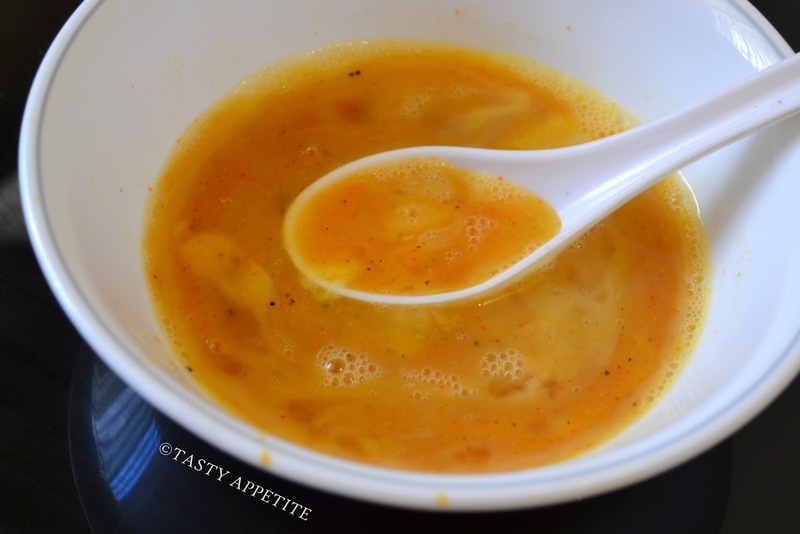 It tastes awesome and satisfying with full of tempting flavors. 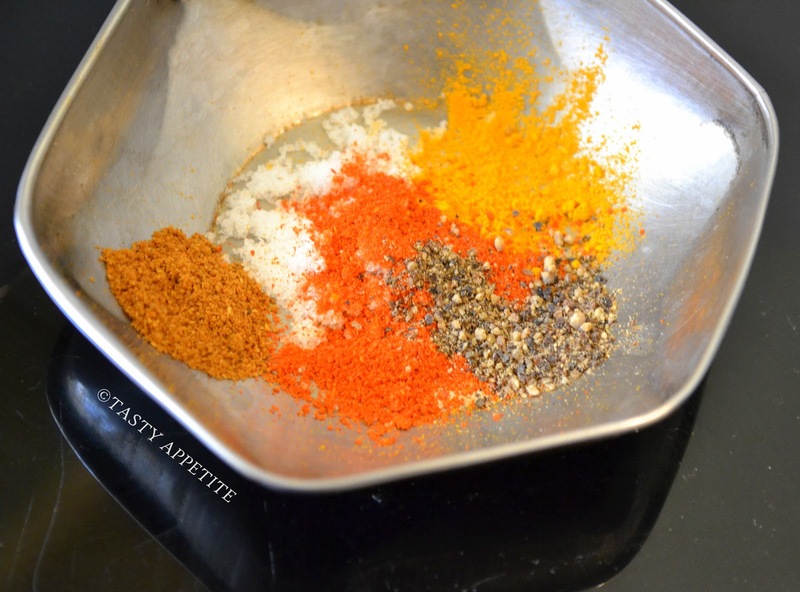 This traditional Indian dish can be prepared with minimal ingredients. In this recipe, the eggs are whisked and mixed in the great Indian masala. 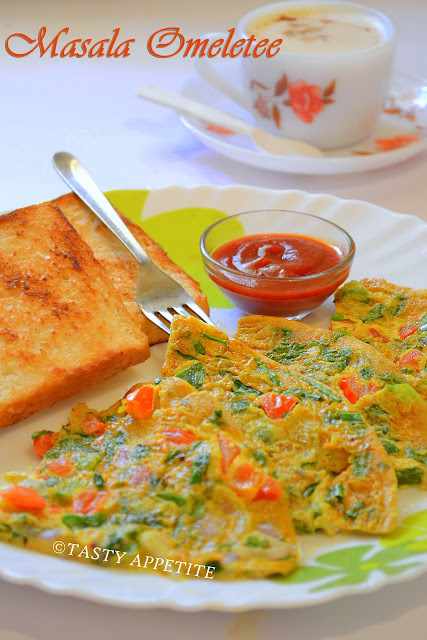 My kids like to eat masala omelette placed between two pieces of toasted bread & with some sauce. 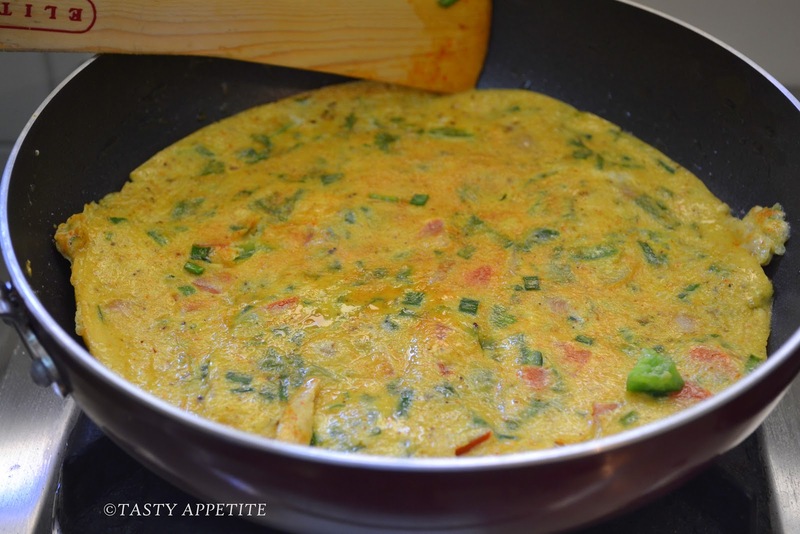 It also makes a filling breakfast dish when rolled it up inside a chapatti. 1. Wash and chop onion, tomato, green ( spring ) onion, capsicum and coriander leaves to fine pieces. 2. In a small bowl , add turmeric pwd, salt, red chilly pwd, pepper pwd and garam masala pwd. 3. Add little water and mix well to spicy paste. 4. Break the eggs directly into a bowl and beat them till frothy. 5. 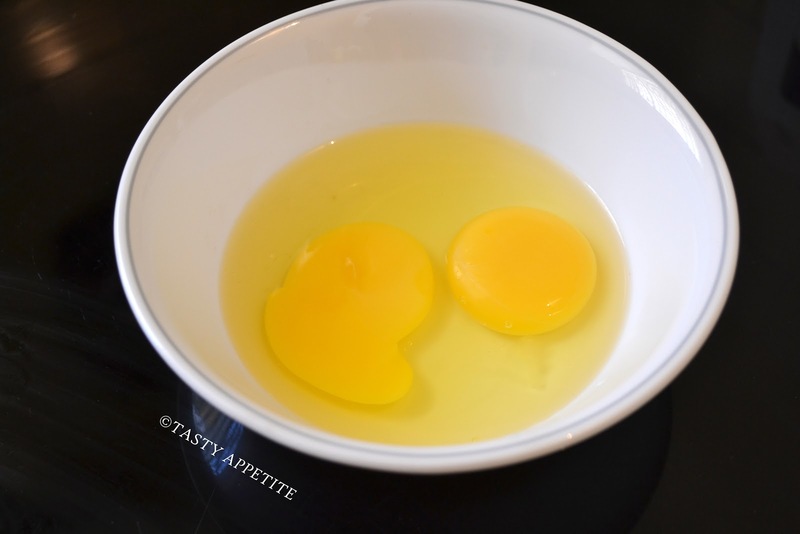 Add the spice paste to beaten eggs and stir well. 6. Add all the chopped vegetables one by one. 8. 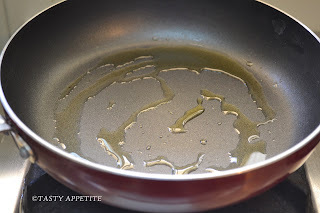 Heat oil in a wide pan. 9. Pour the egg mixture to the pan. 10.Simmer the flame and leave to cook for 2 minutes. 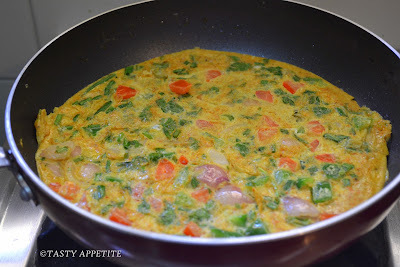 11.Check from the downside of the omelette, whether is cooked and able to flip. 12.Now flip it over to other side. 13.Gently press it down with a ladle. 14.Once both the sides are cooked to golden, remove from heat. 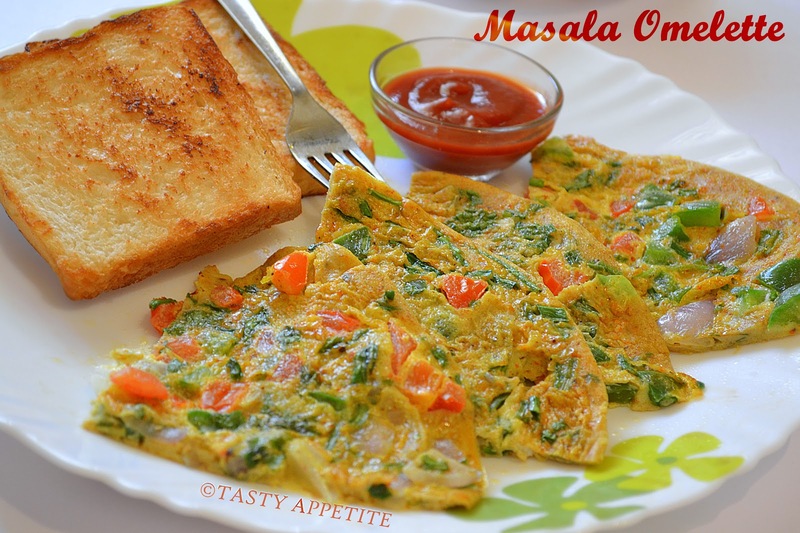 15.Your healthy Masala Omelette is ready..! 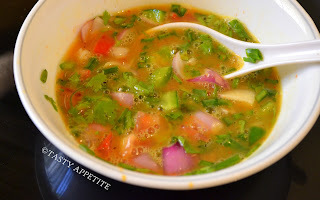 16.Serve hot with Indian roti, bread slice or as it is with any dip. 18.Also it makes a filling combo with a rice and curry..! 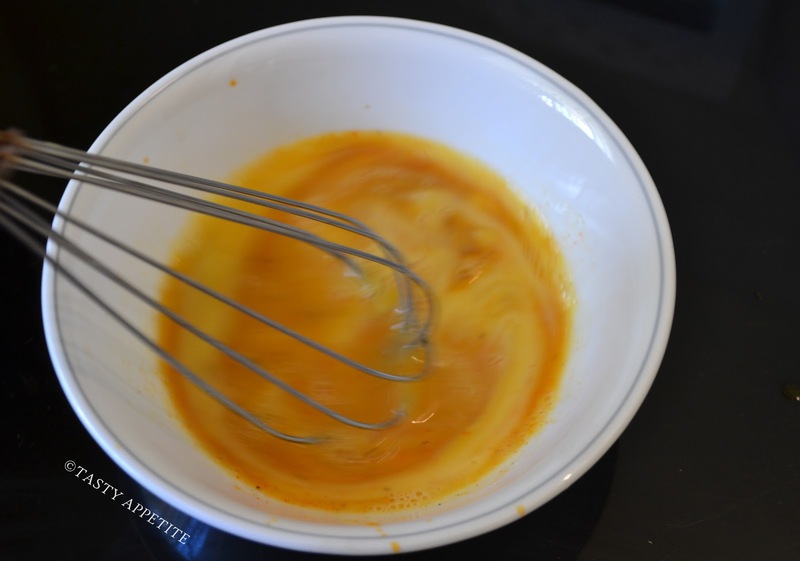 · Always beat the eggs separately, before mixing it with the spicy ingredients. 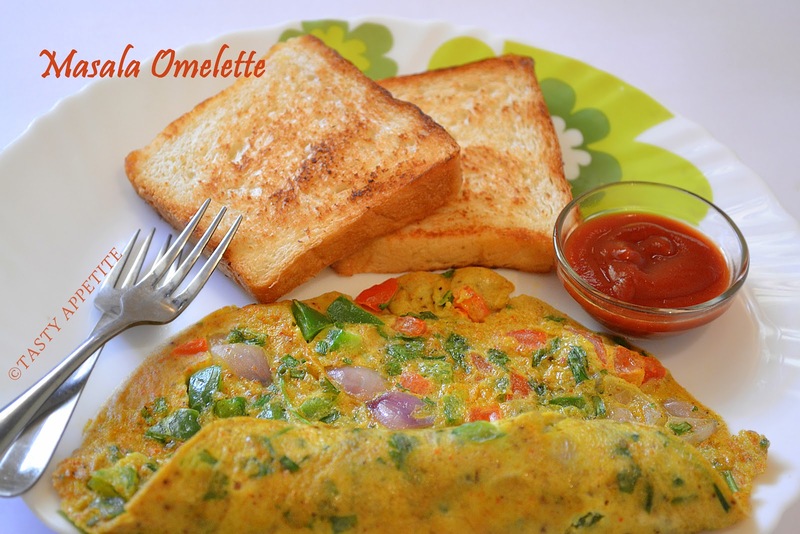 · You can sprinkle little bit of oil and run a spoon inside the omelette for cooking from inside as well. 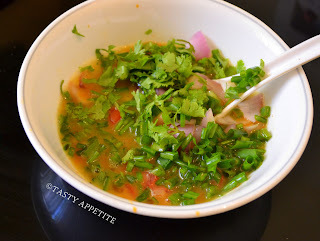 · You can also add chopped green chillies instead of red chilly pwd. 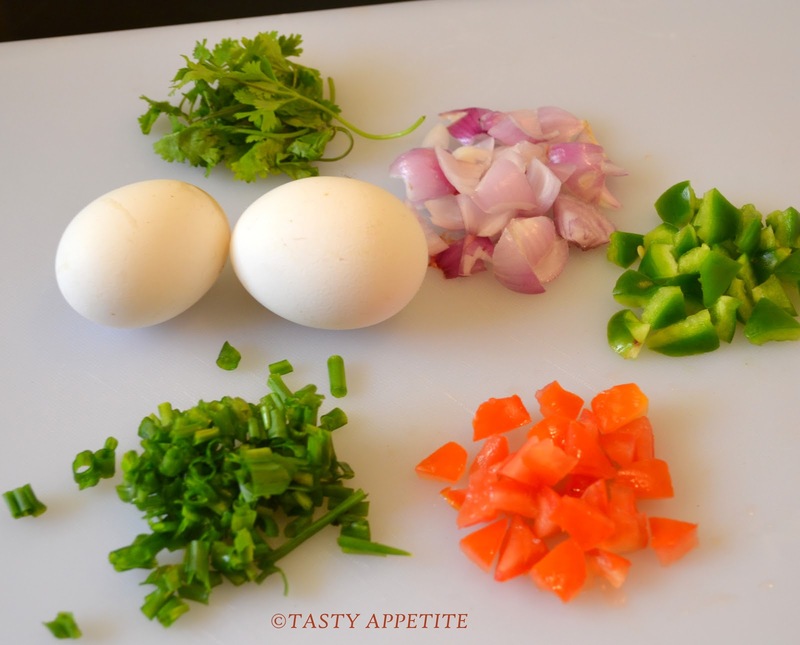 · To make omelette more spicy and flavorful , you can add more freshly chopped coriander leaves and green chilly. This is a wonderful omelet, easy to assemble and very delicious. It is versatile as well because you can not only make a sandwich with it but also roll it up like a cigar and slice it thinly crosswise to add to a fried rice dish. Thanks. Perfect one for a good breakfast plate. spicy n yummy..I do d same process. One of my very favourite, healthy and filling breakfast options.. after a long run this is my carb load up! Breakfast like this can be so refreshing and a great start to the day! Very Indian, spiced up omelette, looks good Jay! looks so delicious.. i love masala omelette.. so yummy! Pure torture dear Jay...Amazingly tempting and beautiful omelette. Hi Jay, this look really good. Thanks for sharing the recipe. YUMMY! 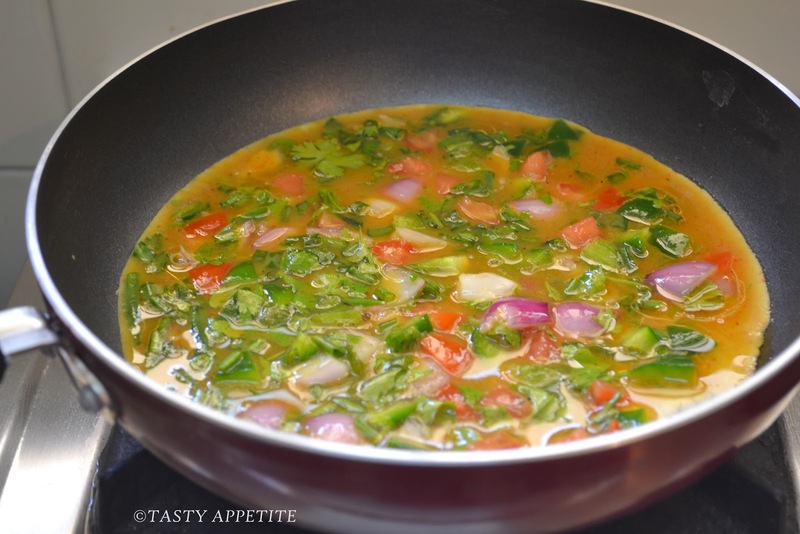 Mmmm..this must be the most flavourful omelette ever! I love omelettes! They look tempting! 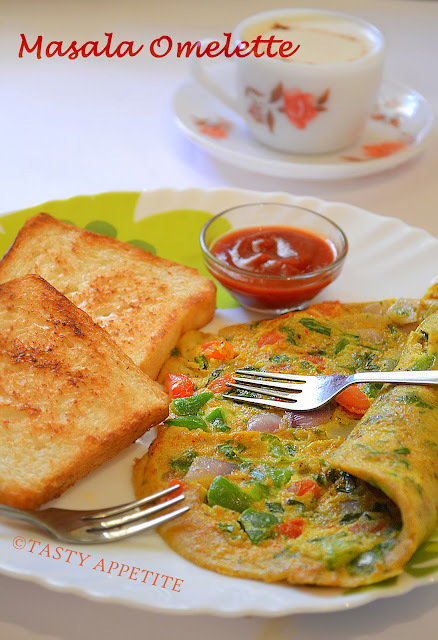 Even i love to have this delicious omelette for my breakfast. 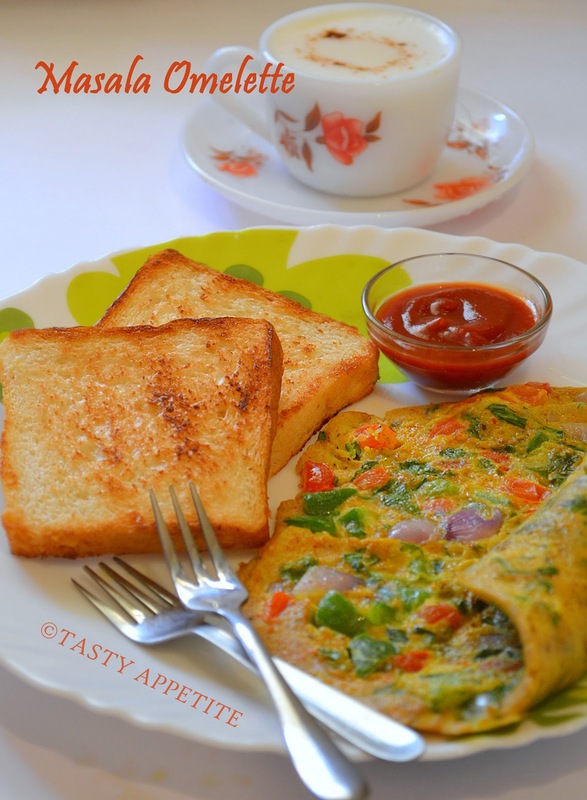 Colorful n attractive omelet !